Zen-Goyomi 2016(Zen Calendar) was introduced from China to Japan in the mid-sixth century and based on the ancient Japanese calendar with the Japanese unique interpretation that has been used throughout the ages for approximately 1200 years from the Heian period. 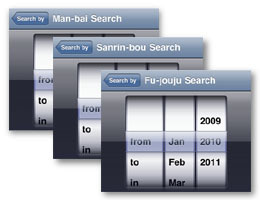 It is a tool to depict daily fortune by comprehensible interpretations. Would you like to make use of the calendar stuffed with much ancient wisdom for a guideline of your daily life? Let's find the most ideal day for shopping, moving, traveling, wedding, new business registration, business opening, new construction, investment, and savings! Data from December 2010 to January 2017 is available. ※We added the following information from App 1.10. * Zen-Goyomi was supported to beacon that was attached to Teito taxi as an advertising campaign. 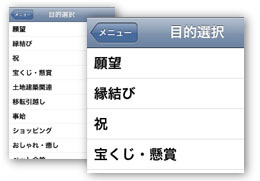 ** We added the function in ZenGoyomi that can be start up with riding the Teito Taxi. 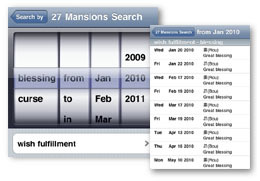 ※The tool uses the data of Twenty-Seven Mansions basis allocated from Twenty-Eight Mansions excluding Gyu＜Ox or β of Capricorn ＞. Display a calendar for one month. 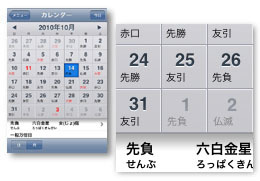 Move to the Previous Month by Left button on the upper left or move to the Following Month by Right button on the upper right. 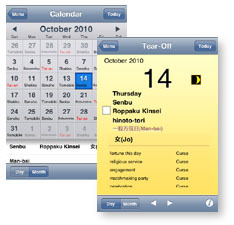 Move to "Tear-Off" screen by "Day" button on the upper left. 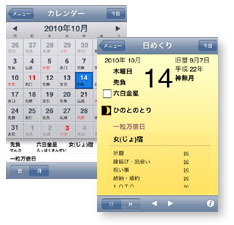 "Rekichu (Calendar Explanatory Note)" on the day will be displayed at the bottom section (column) when you tap on the date. Move to "Rekichu (Calendar Explanatory Note)" screen when you tap on the bottom section (column). 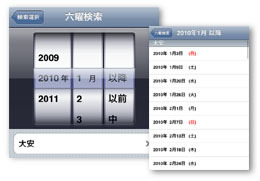 Display the information of your selected day on the "Calendar" screen. Move to "Calendar" screen by "Month" button on the lower left. Move to the Previous Day by Left button or move to the Following Day by Right button on the lower center. 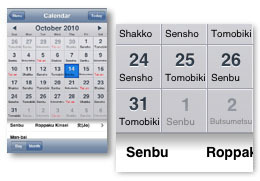 Move to "Rekichu (Calendar Explanatory Note) screen" when you tap on the screen section (column) or "i" button. 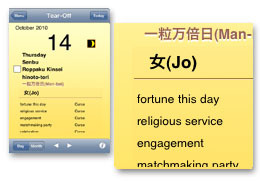 Display a summary of the selected day on the calendar for "Rokuyo (Six-Day of Buddhist Cycle)", "Kyuu-sei (Astrology)", and "Twenty-Seven Mansions". It moves to a "Detail screen" when you tap on the explanatory section (column). 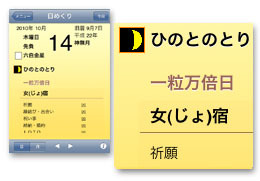 Return to the previous screen of "Rekichu (Calendar Explanatory Note)" by button on the upper left. Move to a "Calendar" screen when you tap on the "Calendar" section (column). Move to a "Search by" screen when you tap on "Search" section (column). 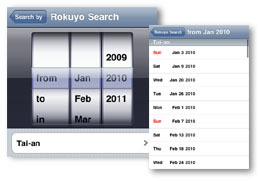 Move to each search screen when you tap on the name of "Rekichu (Calendar Explanatory Note)". 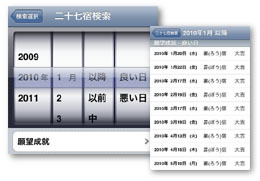 ・Search for each "Rekichu (Calendar Explanatory Note)"
When you select Month, Good/Bad Day, Matter that you would like to search for and then tap on "Search", it displays a list of your corresponded day. When you tap on each section (column) in the displayed list, it moves to "Rekichu (Calendar Explanatory Note)" screen for the day. Copyright(C) 2010 Xenlon Corporation. All Rights Reserved.